Nassim Assefi is a physician, teacher, novelist, content curator, health tech consultant, and civic innovator who enjoys living at the intersection of many worlds. Her doctoring is a blend of internal medicine, gynecology, psychiatry, human rights, and public health. Her consulting work ranges from primary care health strategies for the low income world to health tech start-ups. 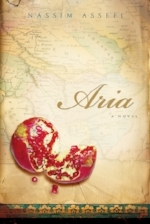 Her novels (Aria, published by Harcourt and translated into 5 other languages, and forthcoming Say I Am You) explore complex issues like grief and humanitarianism. Currently on a service-learning sabbatical in Japan and Morocco, Nassim's last big job was as interim Executive Director of MEDICC, an NGO that translates the remarkable public health achievements of Cuba to the US context and beyond. Before that, she was Director of Stage Content for TEDMED, the health and medicine edition of the TED Conference, leading speaker and performer selection and coaching for TEDMED's annual event.